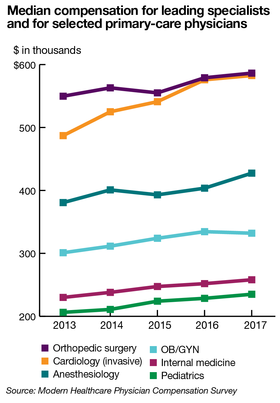 The potential shift from volume to value has had little apparent impact on current physician compensation levels, which stayed relatively flat in 2017 compared with 2016, based on the results of Modern Healthcare's 25th annual Physician Compensation Survey. A possible exception is in primary care, which some recruiters say is in strong demand; it saw bigger pay gains in selective situations. For a second straight year orthopedic surgeons had the highest average annual salary among 23 medical specialties in 2017 with pay ranging from $501,000 to more than $687,000. Fred Horton, president of AMGA Consulting, said it's been a remarkable year in terms of how stagnant physician compensation has been compared to the past. He cited a decrease in the level at which physician pay is being tied to their personal productivity as a major cause for salaries remaining flat. 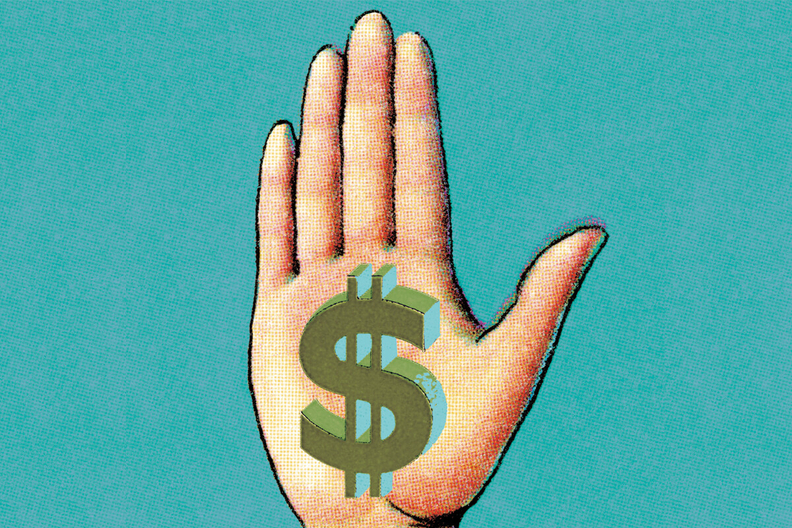 In recent years, factors such as personal productivity, the financial performance of the practice and bonuses have steadily made up a larger proportion of a physician's overall compensation. But the rise has in some ways been offset by the fact that more physicians than ever work as employees at hospitals, where a large share of their overall compensation is based on salary. An American Medical Association report released in April found salary made up the largest share of a physician's compensation, at 53% in 2016, compared with 32% that was pegged to productivity. A March analysis on physician work trends by the Physicians Advocacy Institute in conjunction with Avalere Health found the percentage of doctors employed by a hospital increased by more than 63% from 2012 to 2016. According to the AMA study, salary made up nearly 70% of compensation for physicians who were employees, compared with 30% among doctors who owned their own practices. Some of the leading compensation increases in 2017 were among primary-care specialties. Hospitalists, emergency medicine, internal medicine and family practice docs all saw their average pay increase by more than 3%, according to the survey. Demand within the primary-care specialty market has not only been a result of hospitals' focus on population health management, but also as a means of addressing the impact of the opioid crisis. The percentage of doctors who have become certified to prescribe buprenorphine for medication-assisted treatment has increased in recent years from under 3% of all physicians in 2016 to just more than 5% currently. But even with such high demand, there appears to be no narrowing of the pay gap between specialists like radiation oncologists, who averaged more than $520,000, and family practitioners, who averaged just more than $245,000 in 2017. Changes are occurring, albeit slowly. Jason Farr, senior vice president for the national physician placement firm Medicus, recalls that roughly a decade ago conversations with doctors about what a prospective employer was offering would come to an immediate halt the moment he noted a health system's compensation model was based on a work relative-value unit, or RVU, measure. Today, almost every physician is well-educated on RVUs and value-based compensation models, and many fully expect productivity and some sort of quality metric to be used to determine a bonus on top of their annual salaries, Farr said. “We are seeing physicians these days are much more educated in how this all works than in the past,” he added. Greater awareness among physicians reflects how many are trying to prepare for the transition to value-based payment models despite uncertainties that still linger around what impact Medicare reimbursement changes will have on their incomes. Though much attention has been given in the past few years to the shortages within primary care, there are signs that the demand for medical specialties is also on the rise, which some feel will result in higher salaries over the next year. Annual income increased for 20 out of 23 medical specialties in 2017, with plastic surgery experiencing the largest year-over-year rise at 6.8% compared with 2016. Non-invasive cardiology saw the largest decline, 4.3%. Singleton said that a confluence of factors, such as a highly competitive market, the trend of more physicians opting to work at larger health systems, and a focus on quality rather than productivity has created a favorable market for physicians to make demands for incentives—such as signing bonuses, medical school loan forgiveness, relocation expenses and flexible work schedules—that have become standard for many hospitals that need to recruit talent. But Farr said the high level of competition for professionals has prompted a number of providers over the past year to begin to offer inducements that go outside the normal array of perks. One of the more popular among rural providers has been offering a housing allowance structured either as a monthly stipend or a lump sum for a house down payment, in addition to a signing bonus. Farr said some providers have even purchased homes to offer rent-free to physicians for the first six months to a year of their employment. “It's an incredible recruiting incentive,” he said. Other inducements have included free child-care assistance, car allowances as an incentive for doctors in more rural areas to travel to satellite clinics, and concierge and financial planning services. Such incentives are some of the ways providers of all sizes can compete against the bigger systems that can offer the largest salary packages.